Fuerza Regia celebrated the third straight win in Group B. They overcame Guaros to top the ladder. Andy Panko (203-F-77, college: Lebanon Valley, agency: BeoBasket) nailed 25 points, grabbed 6 rebounds and issued 6 assists for the Mexican side. Guaros went on a 22:9 run in the second term to take an 8-point halftime lead. But Fuerza Regia unleashed 53 points in the second half and rallied to a hard-fought win. Juan Anderson (198-F-93, college: Marquette) delivered 14 points and 7 rebounds for the winners. Zach Graham (198-G-89, college: Mississippi, agency: Pro Sports) responded with 23 points for Guaros. 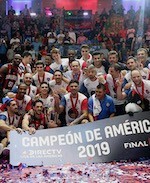 Caballos finished their Liga Americas campaign on a high note. They knocked down Los Leones to finish at 1-2 record in Group B. Ricardo Melendez (179-SG-83) scored 23 points to pace the winners. Caballos secured a 49:35 halftime lead. They poured in 49 points in the second half to seal the win. Javier Carter (203-C-91, college: S.Alabama) delivered 17 points for the winners. Evandro Arteaga (178-PG-83) responded with 15 points for Los Leones.